Everyone has life-changing moments. These are the the clear points that define your path in life – events that take you down a given path. These could include leaving home, going to University, getting married , having a baby, having an accident or losing someone. These moments are times in our lives which we can remember the feeling forever; we can relive the experience in our minds time and time again. On Thursday I had a life changing moment. As I have mentioned before, Mrs Scot works quite far from where we live; 36 miles or so. This involves a long and arduous daily commute. On Thursday night I arrived home earlier than usual (at about 1800) and started answering comments on my blog and reading through others. Mrs Scot phoned me to tell me she was on her way home and we had a short conversation. Halfway through the conversation, I heard an almighty crash and she let out a shriek. My heart skipped a beat as my immediate thoughts were that something terrible had happened. I shouted down the phone asking if she was OK, but it turned out the ‘sat-nav’ device had fallen off the windscreen and bounced on the dashboard, hitting the steering wheel. I got such a freight and told Mrs Scot that I was getting off the phone immediately and to drive safe and take extra care. I hung up with my heart properly pounding…. This is where the story becomes crystal clear in my head… Not even five minutes later, I looked down to see the phone ringing again and I just knew that something bad had happened. I answered quickly and heard Mrs Scot sobbing down the phone saying she had been in an accident. My heart sank. The world slowed down around me, and I can honestly say that I had some short flashbacks. In an instant I relived meeting her, our engagement, our holidays and our wedding. Terrible thoughts raced through my mind and I felt empty inside. To make matters even worse, the mobile (cell) phone reception in my house is horrendous, with the voice cutting in and out sporadically. I shouted down the phone asking her if she was OK, if she was bleeding or trapped in the car. She informed me that she was not bleeding but had a sore neck and back, but the airbags had saved her. She told me that she was crashed in one of the fast lanes of the motorway and that there were four cars involved. After checking that nobody else was hurt or badly injured and that the police had been called, I asked her where she was – which she had no idea. I told her not to try and calm down, not to get out the car into oncoming traffic and that I would find her. With my phone battery at 4% I put it on charge for 2 minutes while I got ready to leave, knowing full well that it was going to die on me en-route. I didn’t know the way to her work and was pretty unfamiliar with the network of roads and motorways in West London. Mrs Scot had the only Sat Nav and I had about 10 minutes of battery to run google maps on my phone. Then, suddenly, I had a revelation – I searched using the ‘Find my Friends’ iPhone app, pleading that this would work and sure enough it gave me a rough indication of where she was. I jumped in my car and about an hour later, with some very irresponsible driving and a very dead phone, arrived at where the app had told me she was – and sure enough, there was Mrs Scot wrapped in a foil blanket with the other cars and the Highway Agency (Motorway Police). I ran across one of the lanes of traffic in true movie style fashion, with my arms open wide and grabbed her. I cannot tell you what a relief it was – and is – that she is OK. This has genuinely made me even more grateful for having such a special girl in my life and I am so thankful that the airbags saved her – and believe me they did. In simplest terms: Mrs Scot was in car 1. Car 2 crashed hard in the back of car 3, which in turn rolled into car 4. This caused car 2 to stop almost instantaneously which meant that the brakes didn’t stop Mrs Scot’s car in time. The whole incident is obviously still really vague to Mrs Scot, however she thinks she was still traveling at about 50 mph when she went in the back of the second car. Mrs Scot is OK – she has a sore neck and back and is wearing a brace for now. The car is very likely a write-off, but will update all the monetary/insurance details on a later post. Right now I am just thankful that my Soulmate is still alive. Do one thing for me – go and tell the special person/people in your life what they mean to you. Don’t think about it, just do it now – Nobody knows what is lying around the corner. (The course of life is unpredictable… no one can write his autobiography in advance ~Abraham Joshua Heschel). OMG. I’m so glad she’s okay! Car accidents are horrible and scary – she must be so shaken up! Accidents like this can really put things into perspective. I bet you didn’t even give a fleeting thought to the damage of the car. Most of us these days do lead quite materialistic lives, but when it comes to the crunch we know deep down the true important things in life. Good post! Sounds like an intense experience for both you and your wife. As Jon said, it does put things into perspective. You truly focus on what is important. I hope your wife is doing better and that the back issues don’t last long. Thanks for the comments guys…. Jon, you are right, materials mean nothing compared to people – I seriously couldn’t care less about a car. We had just started to build an emergency fund – and this highlights the importance of having some financial security for unforeseen circumstances. Did anyone check out the youtube video? It shows us just how powerful airbags are when they go off! That’s a pretty awful experience. Something similar happened when I was dating my wife. Wow, that is scary! 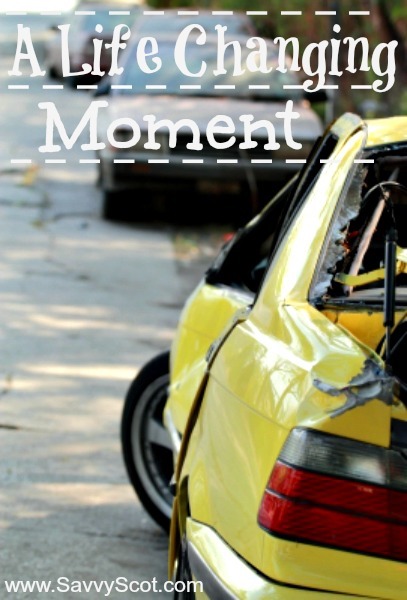 Car accidents are always the worst and you never plan on them happening – well you never plan for anything bad to happen in life. Hopefully you get a good amount of money if the car is in fact a write-off. I totaled my car just after Christmas, it was a new car and I ended up getting the total price of the car back. So, I ended up breaking even…I was NOT hurt, thankfully! That is my worst nightmare. Here’s to a speedy recovery! So glad to hear she is OK. What a terribly frightening event.